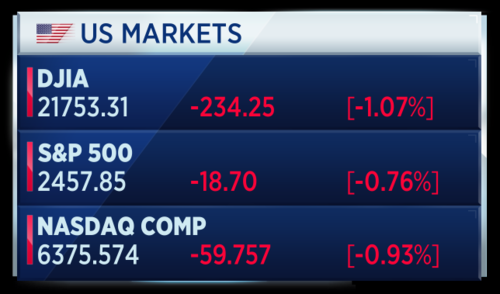 The Dow closes down over 200 points in one of its worst sessions of the year, led lower by financials, which post their biggest declines since May. 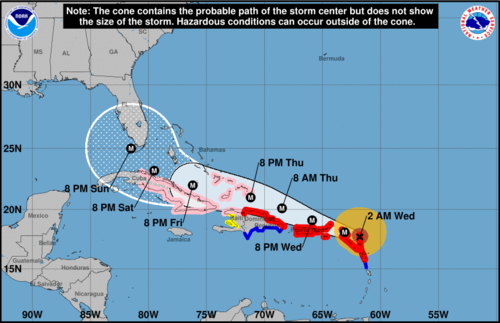 Hurricane Irma strengthens to Category 5 as it takes aim at the Caribbean islands, on a path to Florida, causing flight cancellations and mandatory evacuations. The Trump administration feels the backlash from businesses after scrapping the 'Dreamers' immigration program, while former President Barack Obama says the move is a 'cruel' political decision. 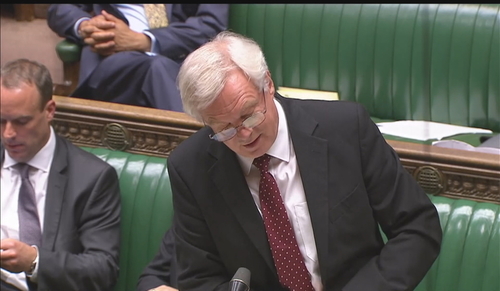 A leaked document reportedly reveals Britain's plan to end the free movement of labor immediately after Brexit, as top negotiator David Davis says the 'money argument' will continue right through exit talks. 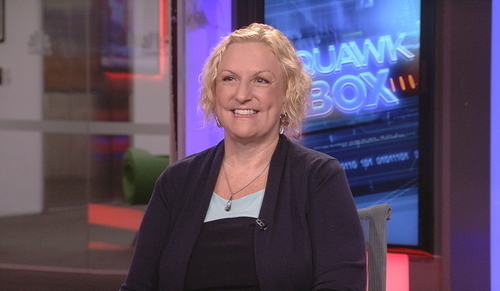 Carol Pepper, CEO of Pepper International is on set to discuss markets. She predicts another sell-off followed by a bounce back up. She is however not positive on financial stocks. Frankly I don't see it in the financials. The street has been pushing this trade for at least two years. Goldman, JPMorgan, everyone is talking about how banks are the place to be. But if you look at what's happening, we are not going to get interest rate rises, we won't get the margins and we are not seeing any particular easing of regulation. Pepper: Prefers EM and European stocks for her clients at present. On the wider picture for stocks she remains positive, suggesting that unless the United States goes to war with North Korea, equities will remain at least at this level if not higher by year end. If you are terrified of stocks at this level then it means you are over-exposed to equities. Pepper says "stay the course through 2017" and she expects Healthcare and Technology to outperform. A leaked government document published by the Guardian newspaper says the UK will immediately end the free movement of labor after Brexit, and begin implementing measures aimed at cutting down the number of lower-skilled EU migrants. The 82 page proposal asserts that "immigration should not just benefit migrants, but make existing residents better off." Downing Street has not commented on the leak. UK Brexit Secretary David Davis wants more flexibility from Europe. We remain committed to making as much progress on those issues which are solely related to our withdrawal, but our discussions this week have demonstrated, exposed yet again that the UK's approach is substantially more flexible and pragmatic than that of the EU as it avoids unnecessary disruption for British business and consumers. I urge the EU to be more imaginative and flexible in their approach to withdrawal on this point. The U.K. and Europe are scheduled to commence talks on trade in October. South Korean President Moon Jae-in says that if North Korea doesn't stop its provocation, it will lead to an unpredictable situation. Mr Moon made the comments to his Russian counterpart Vladimir Putin when they met on the sidelines of an economic summit in Vladivostok. South Korea's President Moon Jae-In speaks during a press conference in May 2017. Russia has indicated that it will consider new U.S. resolutions on sanctions provided it focuses on finding a diplomatic solution. 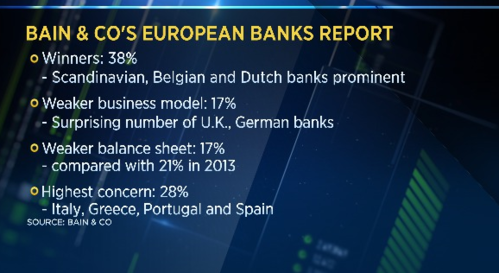 The number of European banks considered to be in danger increased sharply last year. According to a report by Bain, 31 lenders were in the weakest category in 2016 compared to 23 the year before. This despite efforts by European lenders to strengthen their balance sheets and shore up profits. Banks in Southern Europe fared the worst, with the weakest set including 11 Italian banks. 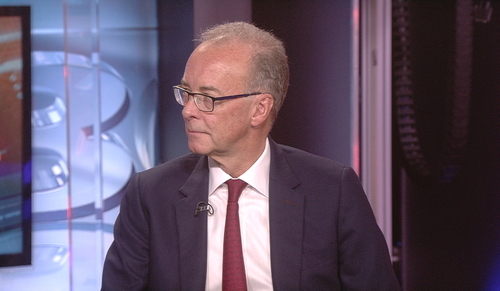 Joao Soares, Partner at Bain & Company is on set and says it is concerning that some banks are consistently becoming weaker. He says stronger banks are getting stronger as capitalization takes hold but a number of banks haven't been able to do this. Soares says the hypotheses that rates will go up and solve the issues on a bank's balance sheet has been in place for several years and has failed to materialize. The Bain partner adds that banks are struggling to sell loan books at the value that they are priced at. Hurricane Irma is expected to hit the Virgin Islands and Puerto Rico before heading toward Florida this weekend. The strongest hurricane ever recorded in the Atlantic Ocean is now a dangerous Category 5, with sustained winds of 185 miles per hour. 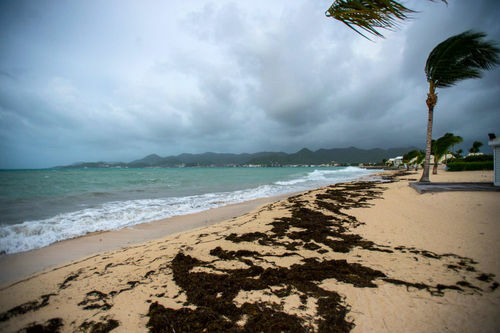 The U.S. National Hurricane Center says Irma is currently about 40 miles north of Antigua. The Federal Reserve's Lael Brainard says the US should be cautious on raising rates given the subdued level of inflation. She was joined by Dallas Fed president Robert Kaplan in urging the central bank to be patient on rate hikes. This ahead of the latest beige book release from the Federal Reserve later today which is expected to show a decent picture of economic activity stateside. 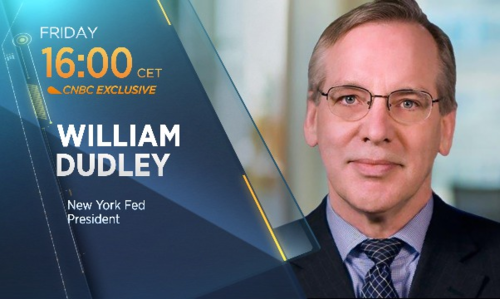 To get a broader picture of Fed thinking, CNBC's Steve Liesman will talk exclusively to the New York Fed President William Dudley on Friday at 3 p.m. London time. German industrial orders have surprised to the downside. Factories posted a 0.7 percent drop in orders in July after a +0.9 percent rise in June. The German Economic ministry said despite the drop, order activity remained at a very high level. The euro gyrated around the data release. 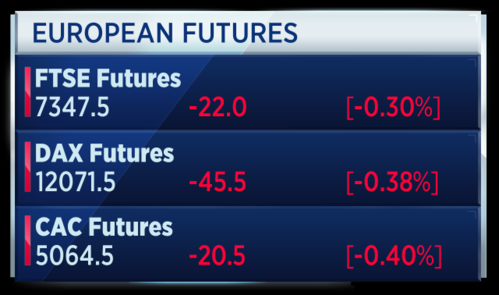 Futures are lower for European stocks. 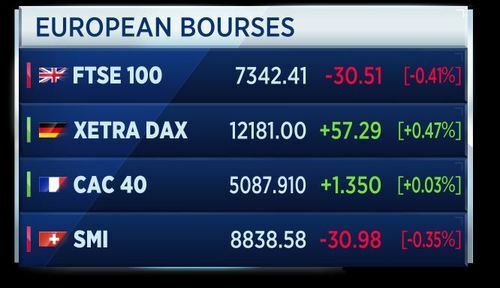 Europe tracking Wall Street’s slide overnight amid a backdrop of lingering geopolitical tension. Tensions in the Korean Peninsula showed little sign of abating following Pyongyang’s largest-ever nuclear test on Sunday. Despite international condemnation in the wake of the isolated regime’s latest test, a top North Korean diplomat threatened the U.S. with “more gift packages” on Tuesday. Russia's President Putin is talking at present at a press conference in Vladivlostock. He has so far said that he has discussed the North Korea situation with his South Korean counterpart, Moon Jae-in. Putin says the North Korean missile testing is a flagrant violation of UN resolutions. 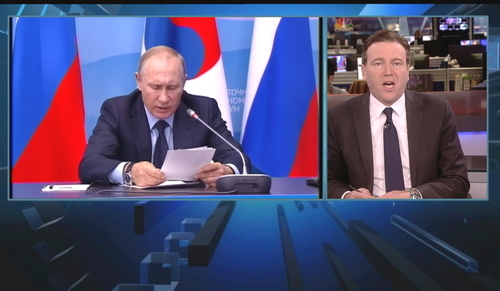 The Russian leader reiterates his stance that sanctions and pressure won't resolve conflict with Pyongyang and dialogue is necessary. U.S. markets closed lower yesterday on a below average volume. For only the fourth time in 2017, the Dow fell more than one percent. Markets, of course, were also in catch up mode after Labor Day shutdown. 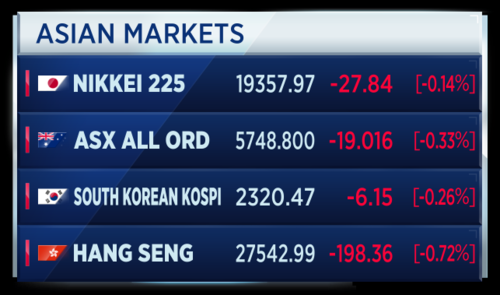 Overnight in Asia stocks are still trading and are at present taking their cue from Wall Street's negative shift. This print taken at 7:04 a.m. London time. The UK Defense Secretary Michael Fallon has told news outlets that the government will set out firm proposals for future immigration rules later this year. He added that Britain is not closing the door on all immigration but the public expects to see migration to the U.K. fall. This after a leaked government document published by the Guardian newspaper says the UK will immediately end the free movement of labor after Brexit, and begin implementing measures aimed at cutting down the number of lower-skilled EU migrants. 78 percent of Stoxx 600 European banks beat on EPS in the second quarter of 2017. 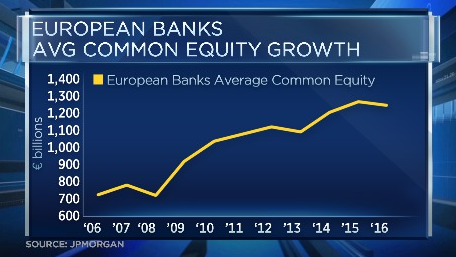 Kian Abouhossein, Head of European Bank Equity Research at JPMorgan says he sees a 15 percent total upside for the sector by the end of 2018. 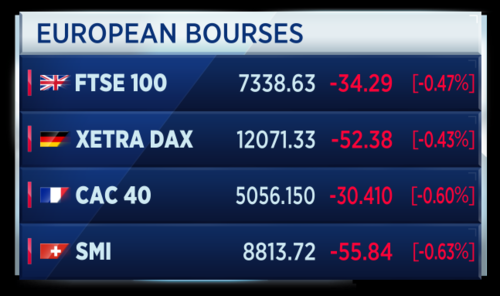 Europe's biggest indices are quite evenly split in the sell-down. These are the sectors that are most to blame for the bias to selling. British property developer Berkeley has reaffirmed its guidance, as it posted pretax profit in line with management expectations. Berkeley warned however that the London market could be hit by uncertainty surrounding Brexit, and a rise in property taxes. Barratt sharply raised its annual dividend after posting a strong set of full-year numbers. The UK's largest house-builder upped its dividend to 17.1 pence per share, a 39 percent increase since 2016. Pretax profit also rose by nearly 12 percent. The French Government is selling a 4 and a half percent stake in gas utility Engie. This as part of a planned multi-billion assets sale. Finance Minister Bruno Le Maire said the proceeds will be invested in innovation. Meantime a new clinical trial has found that patients taking Roche's lung cancer drug have a lower risk of the disease spreading to their brain than Pfizer's rival drug. The results of the study will be presented at a conference on medical oncology in Madrid this weekend. In finance, Black Monday refers to Monday, October 19, 1987 when stock markets around the world crashed, shedding a huge value in a very short time. David Miller was trading at the time but says he sees no parallels at this moment. He says breakers have been put in to the market to prevent such an outcome. The world has moved on since Black Monday. If you want to put it into perspective, the Dow fell 25 percent and in today's terms that's 4 and a half thousand points. Miller: Not at risk of 1987 type event. European stocks follow the US lower, after the Dow posts one of its worst days this year. 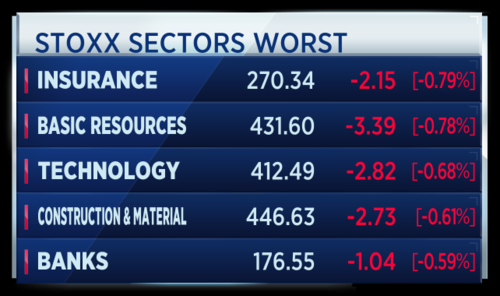 Banks and basic resources lead the declines. Brexit blues for the UK housebuilders. 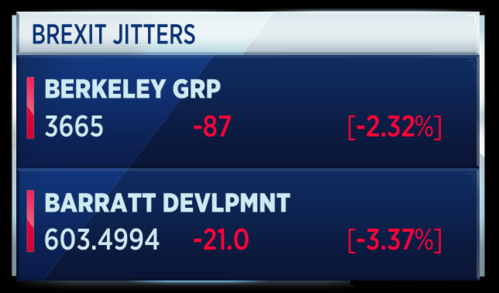 Barratt and Berkeley trade at the bottom of the European market, as both sound a cautious tone on Brexit and see weakness in the key London market. Russia's Vladimir Putin joins the international chorus condemning North Korea's missile testing, but warns the crisis can only be resolved through diplomatic means. 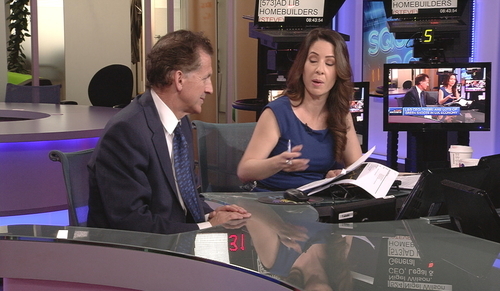 Nigel Wilson, CEO of Legal & General is on set. He says there is an enormous amount of noise but crucial issues such as productivity are getting drowned out. He says regenerating cities outside of London needs to be done to trim the 30 percent productivity gap between the U.K. and countries such as France, Germany and the United States. Wilson also calls for a better understanding of how to grow small businesses. We are brilliant at start-ups and useless at scale-ups. 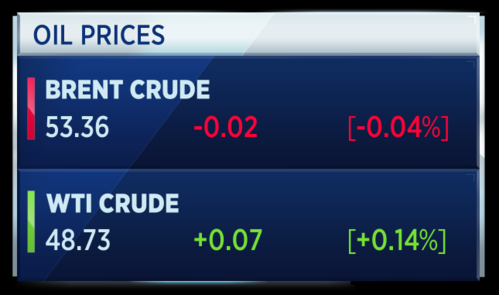 Oil prices are flat in session as demand for crude demand from refineries remain low. This following closures after Hurricane Harvey which hit the U.S. Gulf coast 10 days ago. Italy's July retail sales data has come in at +0.2 percent higher month-on-month. Year-on-year, the July figure is totally flat compared to the same month in 2016. 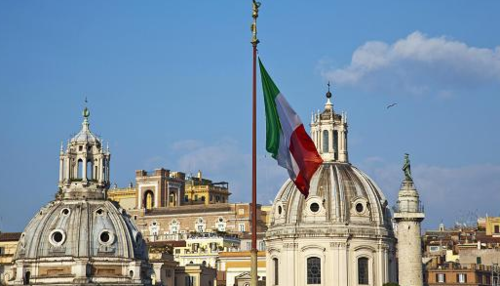 Italy is a country that firmly sits in the slow lane of Europe's economy. A much-vaunted recovery is being talked up so any slice of data is worth studying. A senior treasury official said this morning that economic growth could exceed 1.5 percent this year. That reported by Reuters. The current official target is 1.1 percent. 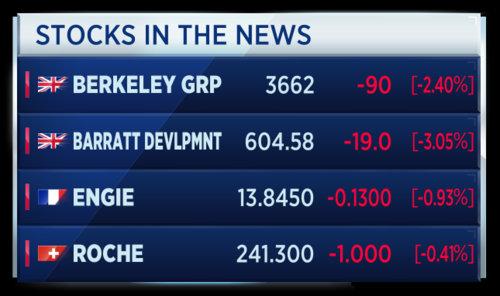 Shares in Berkeley are trading lower after the property developer warned that the London market could be hit by Brexit uncertainty, and a rise in property taxes. Berkeley reaffirmed its guidance after posting pretax profit in line with expectations. 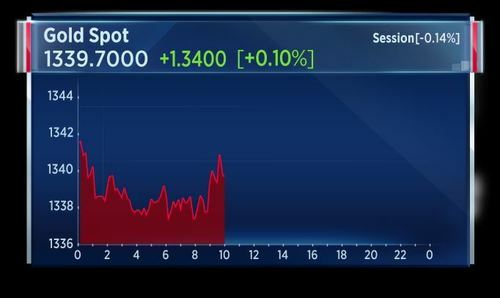 Meanwhile Barratt shares have also been dragged to the bottom of the Stoxx 600. This despite raising its annual dividend after posting a strong set of full-year numbers. Meanwhile wider bourses are lower as the geopolitical tension continues to weigh. In the latest South Korea's President Moon Jae-in has said he and Vladimir Putin share an understanding that resolving tensions with North Korea is a top priority for regional security. Speaking on the sidelines of the Eastern Economic Forum in Vladivostok, Moon said his Russian counterpart expressed his full support for South Korea's efforts to handle issues related to North Korea. 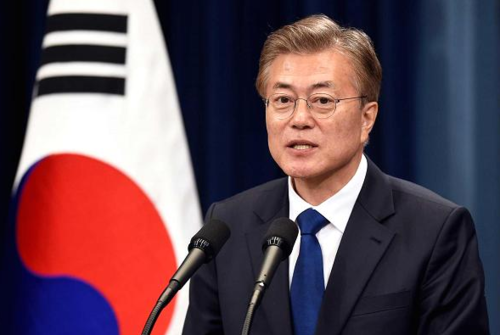 The South Korean president also said it is inevitable that oil supplies to Pyongang will be cut and has asked Russia to cooperate. Daimler says Mercedes-Benz posted record monthly sales every month for the past four and a half years. That's according to Reuters.August deliveries up 8.4 percent in Europe, up 24.5 percent in China, down 10.7 percent in the U.S.
Daimler also says Mercedes-Benz brand August deliveries up 9 percent at 170,341 vehicles. The European Central Bank is working on new licensing guidelines that would also cover financial technology firms, Daniele Nouy, the ECB's top bank supervisor told a conference on Wednesday. At the ECB, we are, for instance, devising a guide on licensing that also covers fintechs," Nouy told a conference. "This guide will be published shortly for the purpose of a public consultation. The technical and financial hurdles have become a bit lower; the (banking) market has become more contestable, Nouy said added. 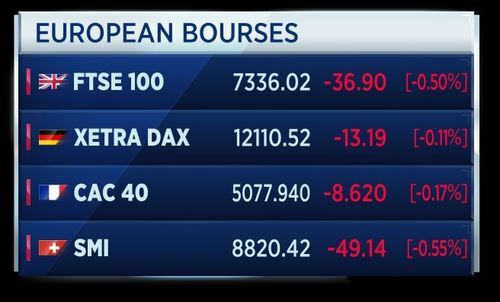 European markets are trading lower, tracking Wall Street's slide overnight amid a backdrop of lingering geopolitical tension. 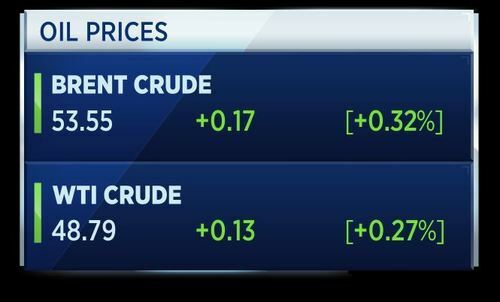 Oil prices slipped on Wednesday as crude demand remained subdued on the back of refinery closures following Hurricane Harvey which hit the U.S. Gulf coast 10 days ago. Fewer than ten of the approximately 40 banks that conduct EU business out of London have applied so far for a licence to continue banking in the bloc after Britain leaves, regulatory sources told Reuters. The slow pace of applications is raising concern at the European Central Bank, the EU's top banking supervisor, that some lenders are not doing enough to prepare for Brexit, or may even avoid its watch through a gap in the rules. The past two months have seen a pick-up in the number of banks saying they plan to set up new EU subsidiaries after Brexit, with most major U.S., British and Japanese banks saying they will establish units in Frankfurt or Dublin. German Finance Minister Wolfgang Schaeuble says naturally no better place than Frankfurt on the continent to host finance post-Brexit. That's according to Reuters. Gold rose towards one-year highs on Wednesday, boosted by tensions on the Korean peninsula and a lower dollar due to growing expectations the Federal Reserve will delay rate rises. 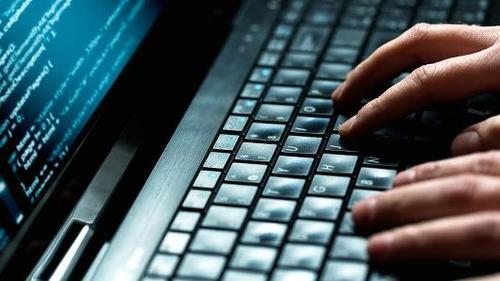 Advanced hackers have targeted United States and European energy companies in a cyber espionage campaign that has in some cases successfully broken into the core systems that control the companies' operations, according to researchers at the security firm Symantec. Barclays believes the recent correction in European equities due to the unexpected surge in the euro has created a buying opportunity, especially for domestic companies set to benefit from stronger economic growth. That's according to Reuters. Since 1970, a strengthening euro has been a crucial component for European outperformance, Barclays strategists led by Dennis Jose said in a note on Wednesday. After approaching 2-year highs in May, European stocks fell for three straight months in August as the single currency peaked above the $1.20 key level, prompting investors to pull money out of European equity funds. While the aggregate market has sold off on the currency strength internally we find little dispersion. Despite euro strength and upgrades to GDP forecasts, domestically focused euro area stocks have so far not materially outperformed, Barclays said. 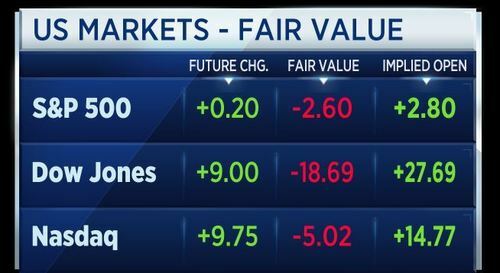 U.S. stock index futures pointed to a flat to cautiously higher open on Wednesday, as investors tried to brush off any concerns surrounding amplified tensions between the West and North Korea, and look to upcoming key data. 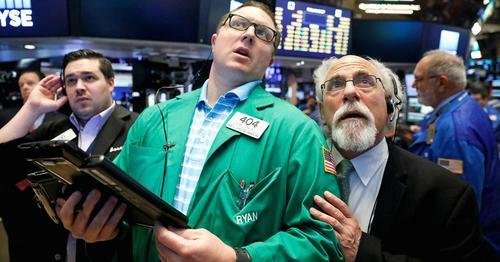 In the previous trading session, U.S. markets came under sharp pressure as fears surrounding the West's future relationship with North Korea added jitters to market sentiment. 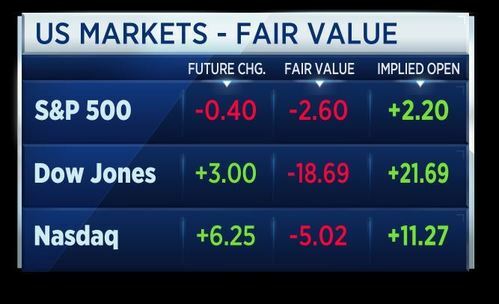 U.S. stock markets are called to open marginally higher later today, according to future values. 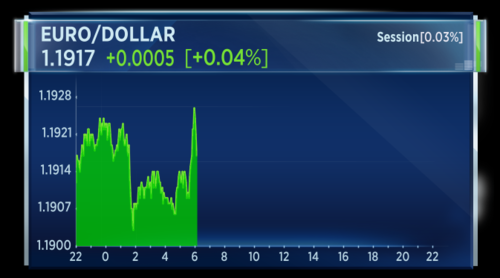 This comes after sharp falls in the previous session as the markets reacted to fresh geopolitical tension between the U.S. and North Korea. Prime Minister Theresa May says overall immigration has been good for the U.K. economy, but people want to see control. This comes after leaked immigration proposals from the Home Office have sparked criticism. Secureworks reports a Q2 loss of 15 cents per share, worse than the expected loss of 8 cents per share. The company sees a Q3 loss of 17 to 19 cents per share, on revenue of $115 million to $116 million. Britain's Prime Minister Theresa May says the country need to control migration to ease the impact on infrastructure and to protect those at the lowest end of the income scale. The U.K.'s Confederation of British Industry has responded to the leaked immigration proposals from the British government. Neil Carberry, CBI managing director for people and infrastructure, says an open approach to Britain's closest trading partners is vital for business. It attracts investment to the U.K. And, with employment high, it also helps keep our economy moving by addressing key skill and labour shortages. Businesses will look for the Government's final position paper to support an open but managed approach to immigration. That means taking the initiative to guarantee those already here that they can stay, a transition period with limited changes so firms can plan ahead, and a final system for the EU that is simpler and more open than the complex work permit system run for non-EEA countries. 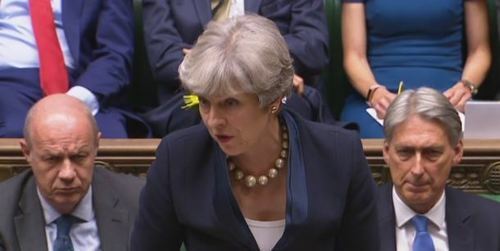 Britain's Prime Minister Theresa May is answering questions in the House of Parliament today. This is the first session of PMQs since the Summer break. Turkey's President Erdogan says the country will provide 10,000 tonnes of aid to Myanmar's Rohingya. 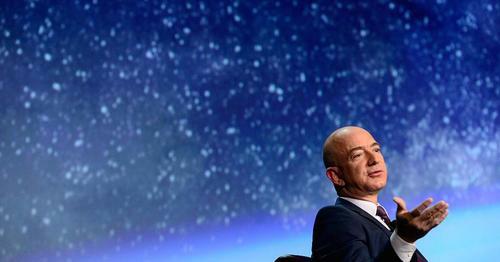 Jeff Bezos, the CEO of Amazon, has called for a "dynamic, entrepreneurial explosion in space" similar to the growth seen on the internet over the past 20 years. The CEO of Amazon has laid out his vision for the future of our civilization, and space is at its core. 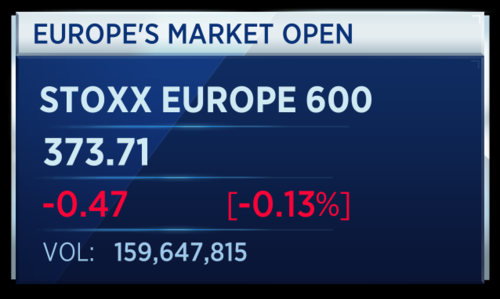 The pan-European Stoxx 600 index is down around 0.14 percent. 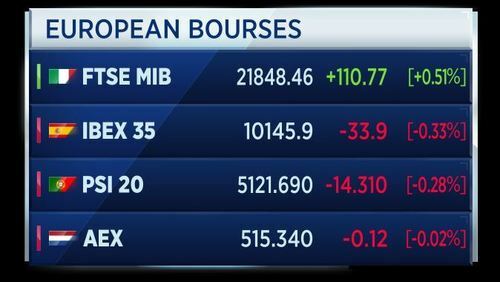 The individual European bourses are more mixed, with some markets, such as the Italian FTSE MIB showing strong gains. The eye of Category 5 Hurricane Irma is passing over the island of St. Martin, according to the NHC. These are the stocks expected to move markets ahead of the U.S. open. One stock to watch is Exxon Mobil, after UBS upgraded the stock to "neutral" from "sell," noting the underperformance of the stock this year and an improved macro outlook for the oil industry.